Bagpipe Solutions by John Cairns has written and developed a new and innovative bagpipe educational curriculum. 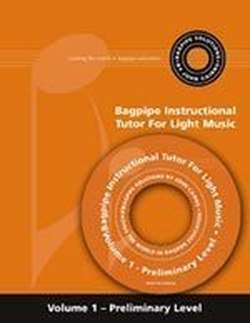 This curriculum has been produced in a series of 18 progressive volumes or levels (12 for light music and 6 for Piobaireachd). Each of the 18 volumes has been prepared in lesson format, so that the student can work through the material in a progressive manner, and comprehend each aspect clearly. Every lesson contains information on why the student needs to learn each aspect, how to study or practice what is contained in the lesson and how to apply this information or skill. Every lesson also identifies specific performance indicators that must be completed or achieved prior to moving on to the next lesson. This curriculum contains in-depth material on all aspects of piping - including theory, maintenance, tone, tuning, band and instrument drill, technical playing, reading music (time and rhythm), the wearing of highland dress, music instructional training, bagpipe history and ear training. Each volume comes complete with more than 100 pages of instructions, photos, diagrams and music, and has been specifically written so that the layman can easily understand the content. All of the material has been spread out over the 18 volumes and structured so that the student will learn what they need to know in order to complete the desired performance level. The first six volumes for light music will bring the student to a point where they are capable of playing in a parade band or for the massed bands. Light Music Volumes 7-12 have been paralleled with a specific solo grade (5 to Open) using the Pipers' and Pipe Band Society of Ontario (PPBSO) solo requirements as the benchmark. The same method has been used for the six Piobaireachd volumes. Volume 1 is an introduction to Piobaireachd, and Volumes 2-6 have been paralleled with a specific solo grade, using the PPBSO solo requirements as the benchmark. The material contained in these tutors includes all of the requirements for both the Institute of Piping and the Royal Scottish Pipe Band Association Structured Learning Certification Programs. This will provide a student (once they have successfully completed a specific level) with all of the information and required skills necessary to achieve the corresponding certification level from one of the two international bodies mentioned above.